Up for grabs on eBay is this dead on replica of Batman's utility belt as worn by Adam West on the 1960's TV series. 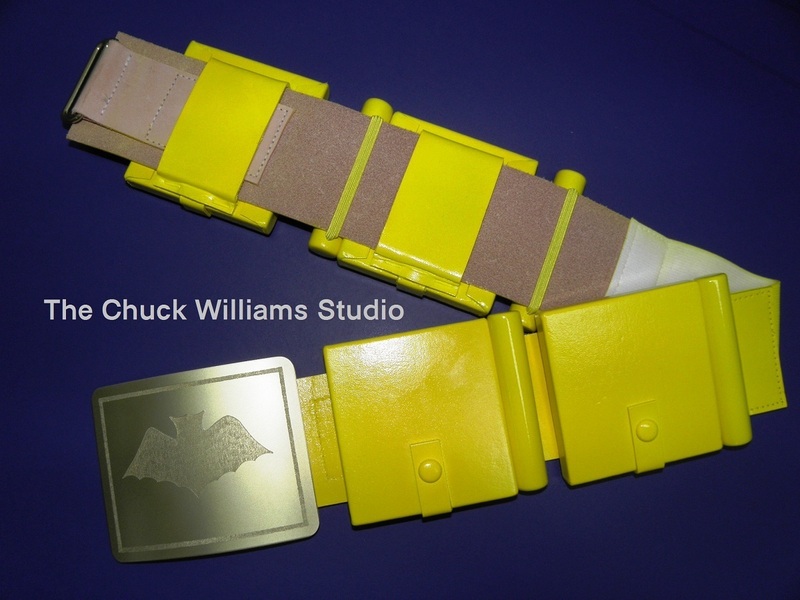 Batman's belt is produced by fellow Bat-fans and friends Chuck and Lynne Williams. Chuck and Lynne are the go-to duo for remarkable replica Batman and Wonder Woman costumes and gauntlets. They have painstakingly analyzed the original TV costumes and color, fabric, and patterned matched them to an exact match. Just in time for the Holidays, here is a replica Utility Belt based on the classic belt Adam West wore on the 60’s T.V. hit show Batman. I few years ago, I was part of a team that examined and documented a set of screen used original costumes from the show. I have incorporated what I learned into this beautiful replica prop. You will not find a replica Utility Belt so close to what was worn on screen offered anywhere else. The brass buckle is the correct size and thickness as the screen used buckle and has the most accurate bat art and metal finishing ever offered. It’s attachments are silver soldered on and it is coated with a musical instrument grade brass lacquer so no polishing is needed. The boxes are leather over wood and non-functional. The tubes are wood with elastic belt loops. Belt is all leather with an elastic panel at the back that accommodates a 32"- 36" waist. The belt is the same leather thickness and cut in the same size as the original belt that I examined. It is all painted as was the original belt with a unique flexible paint that color matches the screen used belt. In person the color is a bright, almost a neon yellow just like the original. It is very difficult to convey it in the photos. It has no vinyl in it's construction. Vinyl was not on the original belt I saw so it's not here either!! This is my take on a more authentic, as it was on set, Utility Belt. You won't be disappointed gang. If you been wanting to pick up this sort of Batman prop, now is your chance. You can also check out other great TV series props and costumes at Lynne's Etsy store.